The Damietta is found in the north eastern portion of the Nile delta and the Mediterranean coast. 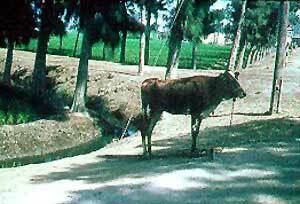 A variety of Egyptian, it is an important dairy animal for the region. The breed bears a strong resemblance to the Shami (Damascus) breed of Syria but has finer and more erect horns. Damietta are usually red but will occasionally have some white markings.